Cheesesteaks have always been a favorite among the Rotio family. Shaved sauteed steak, melted cheese, on a nice, fresh, crusty roll. Hope, NJ - the town I grew up in - has one (blinking) stop light and 1800 people. It is a small, beautiful "village" in western New Jersey that truly embodies "The Garden State" mantra. We may have more pizza places per capita in the US than any other city at one pizza place per 900 people - Hope has its priorities in order. A good east coast pizza place will also - more likely than not - make a good cheesesteak on good bread. My brother specifically asked Gio's pizza in Hope for a cheesesteak "with just cheese and steak" so many times that they ended up putting "just cheese and steak" on their menu so he wouldn't have to specify anymore. Last night, Katie and I were watching Iron Chef America - Battle Ribeye and Bobby Flay prepared a ribeye dish with cheesesteak flavors that inspired us to create our own. 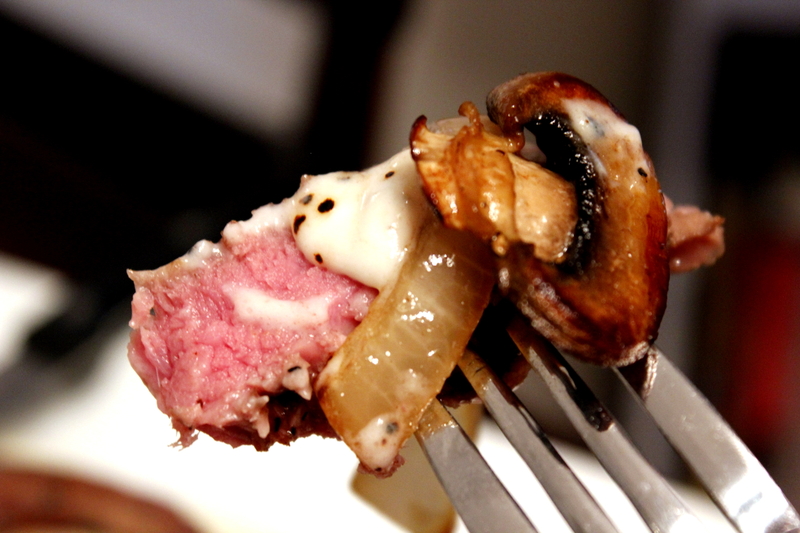 Ok, ok so the "gluten-free cheesesteak" title was a bit of a joke - it's not a true cheesesteak - but this is our interpretation of a plated cheesesteak with those classic flavors: Sous Vide ribeye, Provolone Sauce, Sauteed Onions and Mushrooms. It tastes so much like the real thing, i may just have to cover this ribeye with ketchup... BLASPHEMY! 1. If cooking beef sous vide style (recommended), season beef with salt and pepper and prepare according to the technique outlined here. 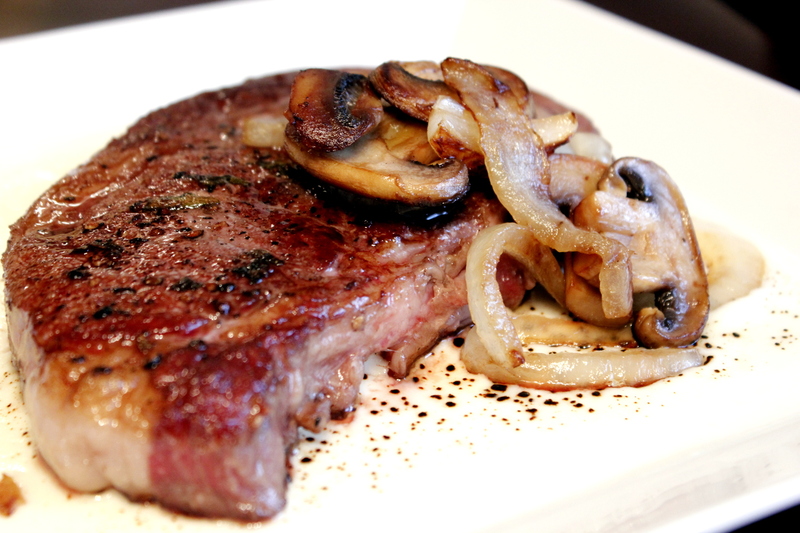 If grilling, grill steaks on medium high until interior temperature reaches 130-135 for medium rare. Remove from heat and cover with foil and set aside. 2. Start sautee ingredients on medium, stir occasionally until tender, season to taste. 3. For provolone sauce, start butter, garlic, and salt in a pan on medium heat. Whisk in flour to create a roux. Continue cooking until light brown. 4. Whisk in milk. Continue whisking until milk is hot and begins to thicken, you may need to turn heat down if this starts to bubble. Slow, low and lots of whisking, you dont want to break this sauce. Add cheeses, continue whisking. Once cheeses are melted and sauce is thick, ladle generous serving onto plate. 5. Torch provolone sauce (or place under hot broiler) to caramelize cheese. 6. 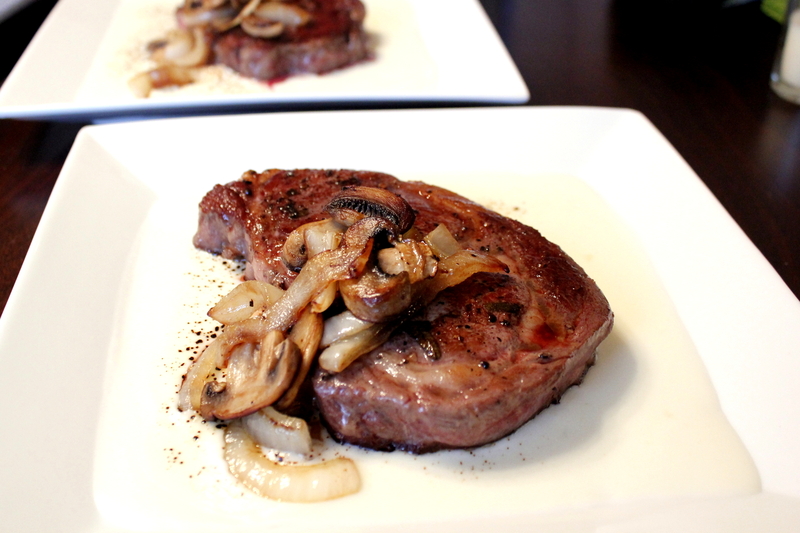 Plate rested steak and top with sauteed onions and garlic. 7. Try your best to avoid adding ketchup.